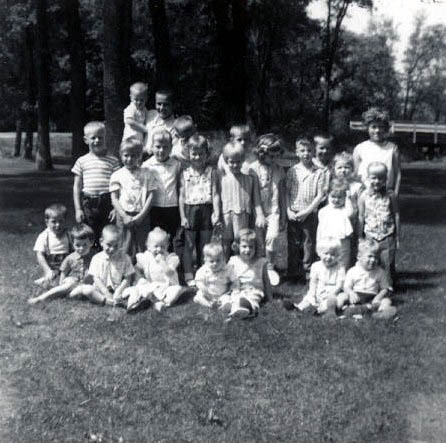 I grew up in Buckman, Minnesota in the sixties and seventies, surrounded by great grandparents, grandparents, uncles, aunts and all kinds of cousins. The Buckman/Pierz area was settled by German Catholic farmers. It was a great place to grow up. Our farm was just outside of Buckman. My dad had grown up in Buckman and my mom in Pierz. My dad’s parents lived about a mile away across the fields, and my mother’s family lived a few miles away just south and east of Pierz. My great grandparents settled in the area when they came from Austria and Germany with their families in the late 1800’s. 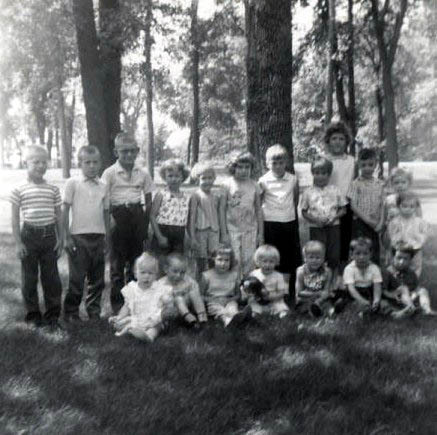 It was, and still is, a tight knit community where everyone knows everyone else and they socialize mainly through church activities and hunting, fishing and farming interests. We were always surrounded by extended family. If anyone got married or died everyone attended. We went to every church Bazaar and our family social life was mainly visiting and hanging out with relatives. 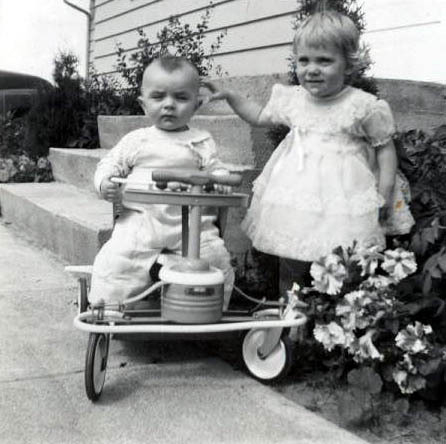 My dad had only one brother, who was a priest, but he had a cousin, Ray in the area who was like a brother and his kids were close in age and we played with them a lot over the years. 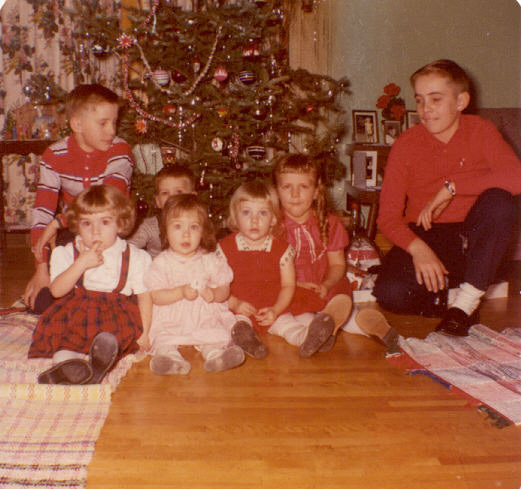 My mom was the oldest of a family of six and her dad was from a family of six, and her mom was from a family of ten, so there were a lot of cousins and second cousins and great aunts and uncles and so on. Family reunions were a blast! My mom had two sisters who were close to her age. In her family they had three girls and then three boys. One of her sister’s, Marilyn, settled in Buckman about two miles away from our farm and the other, Corrine, settled just east of Pierz. 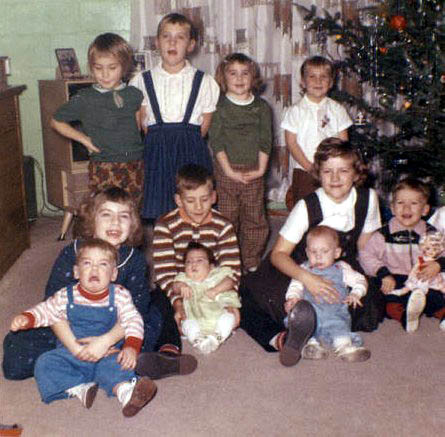 Marilyn had seven children, Corrine had five and we had five. 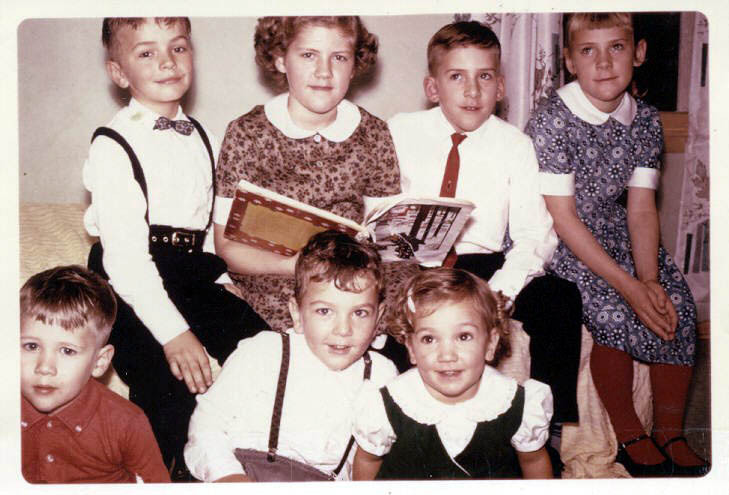 The kids spanned in age over about a 15 year or more period, but we usually all played together. We were very good at being inclusive rather than exclusive. 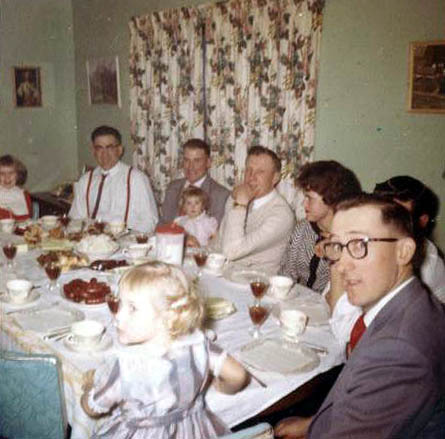 As one of the older ones, I remember having big family get togethers and I would almost always be carrying a baby or watching after a younger child. I usually had a little one on my lap and it usually was not my younger brother, but a young cousin. Everyone got along really well or at least after all of these years, I don’t remember any real conflict. I do remember that we stuck together on our outdoor adventures and we watched out for each other and the little ones. Back then our parents did not hover. We were left to run around the farm and play without any supervision. The parents played cards or visited and they expected us to get along, play nice, and not do anything dangerous. We knew the expectations and most often followed the rules. played in the hay barns and the corn fields and we climbed trees and we rode bikes. 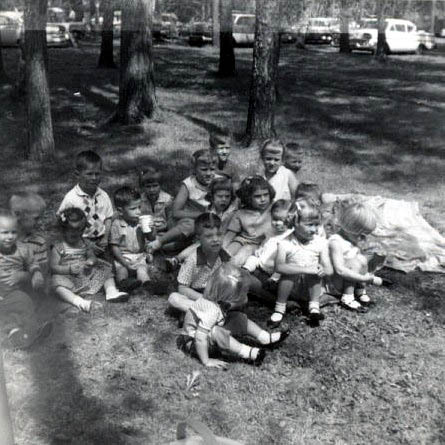 We were outdoor kids. When we got thirsty and hungry we sometimes snuck into the house and one kid took potatoes chips and another took a bottle or two of pop and we went out to the barn and shared our loot. Sometimes we also took the Ketchup from the refrigerator and used it as dip. Once in a while we took a package of Jell-O and shared the powder out of the box. It was exactly like the old time candy called Pixie sticks. I think that may still be around. Had we asked for the treats, I am sure our parent s would have given them to us and I am sure they knew we were taking them, but sneaking in to take them was a lot more fun and adventurous. My aunt Marilyn lived closest to us. She originally had an old farm house that was two stories and we loved playing there. When we were young I remember we had Pop It bead fights. Pop it beads were plastic, hand-size beads that connected together to make things. 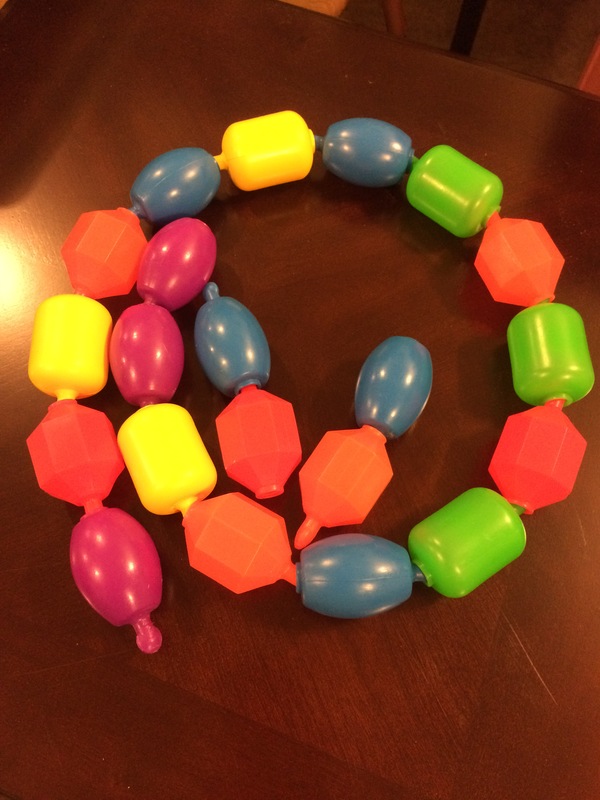 It was really a baby toy but we used them as grenades for Pop It bead fights. If you grew up in the fifties and sixties you have seen them. I am not so sure they still make those, but I still have some that I found for my kids and I kept them because of my fond memories of sitting behind furniture in teams and having a pile of Pop It beads next to us, and throwing them at each other in a Pop It bead war of sorts. This sounds strange, but I have vivid memories of playing that in my aunt’s farm house. I also remember doing Light Bright with my cousins, and then turning off the lights to admire our creation. They also had one of the coolest doll houses. It was made of metal and had rugs and wall paper painted onto the metal. We had doll furniture and dolls to arrange in the dollhouse, and surprisingly that kept us busy for hours in the upstairs play area. 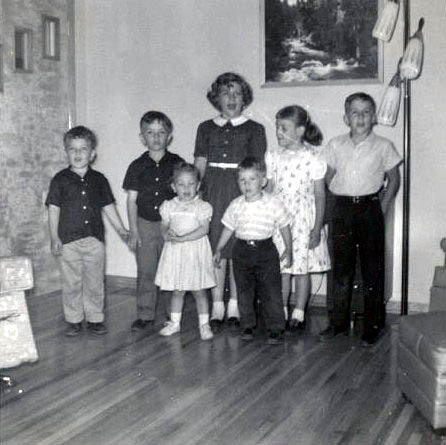 Marilyn had the seven children and she had a really fun and loud house. We liked going there. The parents had their standard laugh and exchanges of those statements of those darn kids and then the standard reply was to tell us to settle down and behave. We played a lot in their hay barn and in the outbuildings which were full of cool old farm stuff. Corrine had an apple tree and was an excellent cook and baker. She was the best! We looked forward to her dinners and her apple pie. We played and got together at our farm too. We had endless fields and beef cows and lots of outbuildings including a storage shed we referred to as the shendy. We played a game over the top of the shendy called Annie Annie Over where you had teams on each side and the ball was thrown over the top of the shendy. If the team on the other side caught it, they all came running over to the other side to tag out the other team. If we got tired of games we thought of other shenanigans. We climbed in the barns and the silo. Once at our farm we convinced my cousin Karen to climb a knotted tree of ours that was not very high and then to jump down into a large blanket being held around the sides like we had seen firefighters do on TV. There were about ten kids holding around the edge of the blanket, but that blanket never even slowed her down. She hit the ground with a thud. Luckily she had jumped feet first and only had a sprained ankle. Sometimes we tried things we should not have. We played a lot of Kick the Can at our farm and hid in the corn fields around the house. We swung in the barns and we made hay forts. It was a nice place to grow up. We played at Ray’s farm too. Our cousins there were also close in age and his farm was the most fun. He had chickens of all colors, geese, and turkeys wandering lose in the yard. You could hunt for eggs and play in the corn cribs. Ray’s farmyard was, and still is, full of beautiful flowers. 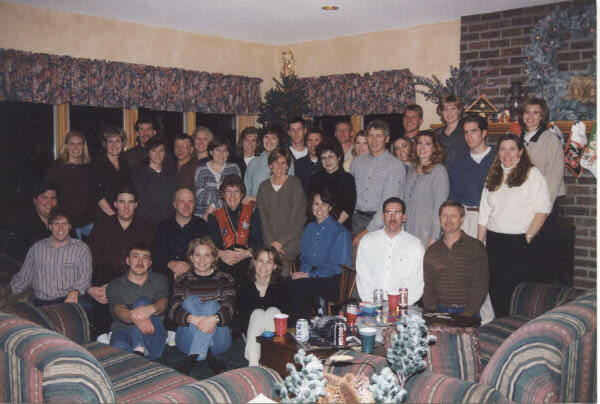 Some of our cousins were almost as close as siblings and even though some of us have left the Buckman/ Pierz area, and are scattered around Minnesota, we remain close. Some of us still go camping together and get together for dinners, parties and family events. We still see each other at funerals and weddings. We make time for family, because family is important. Our parents and aunts and uncles taught us to be good people and to value family. They taught us to let everybody play, to be fair and to be nice to the younger, weaker kids. Nothing else would have been tolerated. They taught us to be gracious winners and good losers. They taught us to be polite, respectful and helpful. They taught us that it is OK to explore, but they also taught us to watch out for each other. These were all great life lessons that are just as important today in our workplaces, in our homes, schools and in our neighborhoods as well as just the right way to live our lives. The world would be a beautiful place if everyone lived by the rules we learned with our cousins. We may not be able to change the entire world, but we can do our best to live by these rules in our daily lives and hopefully set an example for others. Living by these simple rules not only is the right thing to do, but it makes our little part of the world a better place for all.